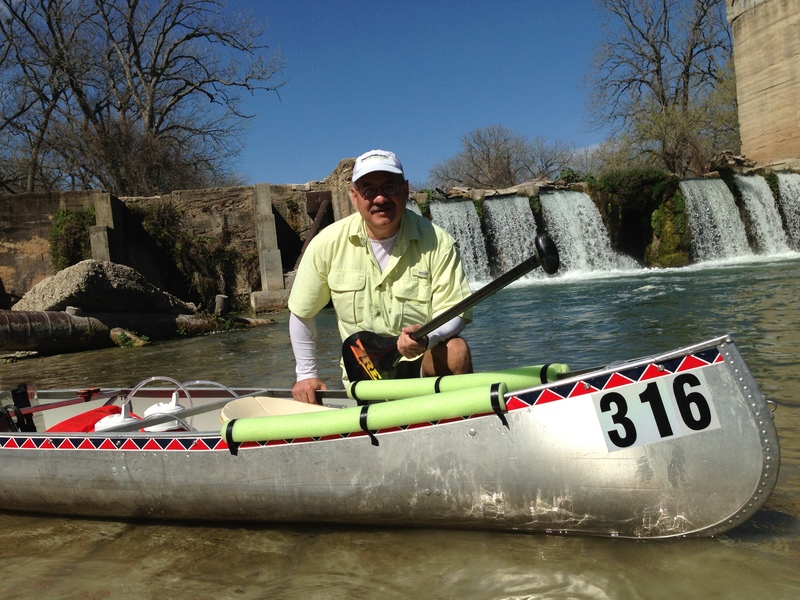 With each passing week, the pressure is mounting to prepare for the 260-mile Texas Water Safari ultra-marathon canoe race. Although the start of the race in June is still months away, my opportunities to train are limited because of my travel schedule. I leave for India on Thursday and will be away for ten days. That’s why I thought it wise to take a vacation day today to do one more training run with Doyle before I leave the country. As more and more folks follow our training adventures on my blog, I get lots of questions about the race and about our training. So, I thought I would answer some of those questions in this post. At Cummings Dam along the San Marcos River. Q: Is everybody doing the race in a canoe? A: No. While many racers opt for a canoe, many race in kayaks of various lengths — some with solo and tandem paddlers and some with as many as six paddlers. And, for the first time last year, my new friend Shane Perrin did the safari on a stand-up paddleboard, making safari history! Q: Why did you choose to do the race in a canoe? A: Because an aluminum canoe is very tough and more forgiving than boats made of other materials, which is great for newer paddlers like us. Q: What is a typical training day like? A: Well, today Doyle and I did the first sixteen miles of the course once again. Below is a timeline of today’s training. 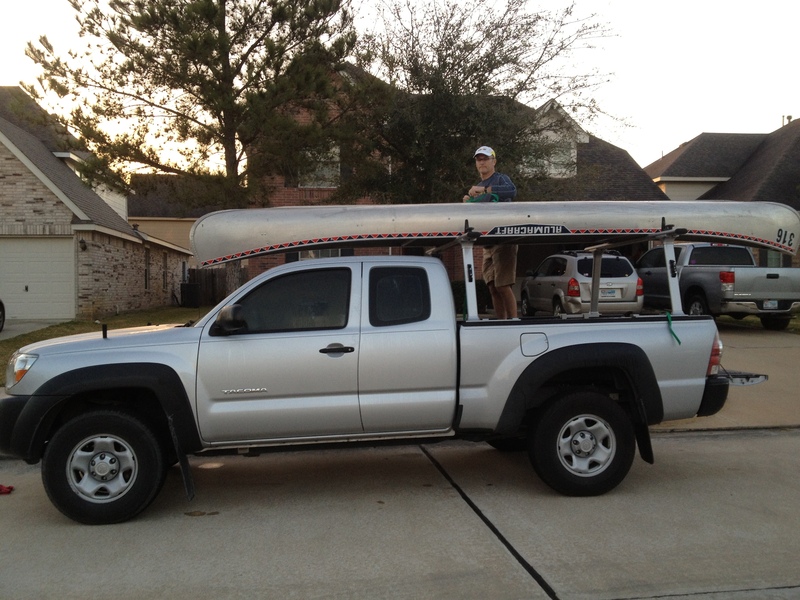 Loading canoe and gear at 6:45 AM. Q: What do you talk about while you train? Doyle: Let’s paddle toward the vee in the current up ahead. Doyle: Hut (voice command to paddle on opposite side). Omar: I see a sub (submerged log or object) ahead. I’m gonna’ draw slightly right. Doyle: Ok. Stay right and then follow the current to the deeper water near the bank. Omar: Feral hogs ahead on the left bank. They do lots of damage! Doyle: Look at that thing run up the bank. Looks like a locomotive. Omar: Water looks really shallow ahead. Doyle: Let’s veer left and keep this line toward the opposite bank. Hut. Omar: Got it. Love this cool weather. It’s gonna be super hot when we do this in June. Doyle: Hut. Yeah. I still can’t wrap my mind around this race. Omar: Just think that on race day we will be in this canoe for at least four days! Q: How many more training runs will you do before the race? A: We are trying to squeeze training runs in wherever we can on our calendars. We have already registered for the Texas River Marathon race in May. This is the preliminary race to the water safari. We hope to get a better starting position at the safari as a result of doing this race. We also have training runs scheduled with my son Jonathan and his safari paddling partner, including paddling the San Antonio Bay crossing to the finish line. Doyle’s cool souvenir from today’s training run. 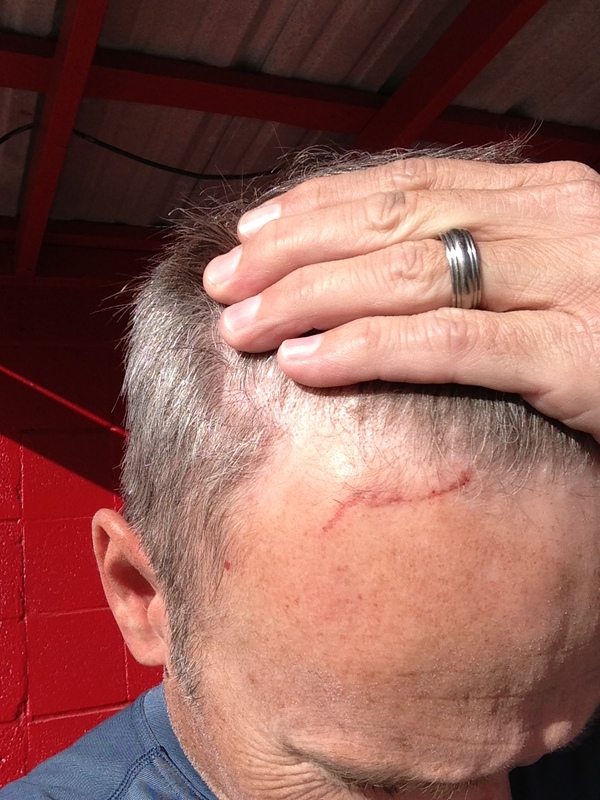 Paddling under tree branches can hurt! Q: Are you afraid you might not be able to finish? A: Anything can happen along the way that can unexpectedly throw a wrench in the works. But, barring nothing like that, we are determined to make it to the finish line in the allotted time. Q: Do you feel that you have made progress in the time you have been training together? A: Absolutely. We both feel stronger after each training run. We are also being very intentional about our paddling technique. We will paddle an estimated quarter-of-a-million paddle strokes during the race, so we want to make sure we paddle as efficiently as possible. Today’s training run as plotted by our Spot Tracker. Q: Will we be able to follow your progress during the race? A: Yes. We are hoping that many of you will make it to some of the checkpoints along the course. And we will also have a Spot Tracker during the race that will send our position every few minutes to an online map that you can follow on your smart phone or computer. Also, my daughter Niki who will serve as our team captain has set up a Lone Star Pastors (our team name) Facebook page where she will post our video updates recorded at checkpoints during the race. More in the weeks to come. 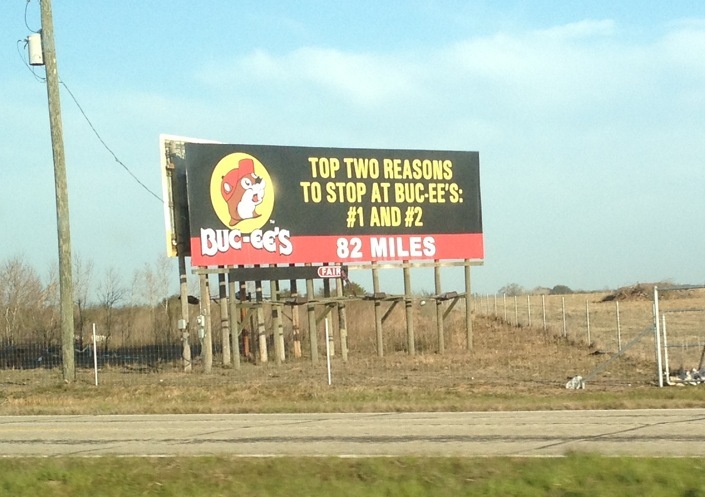 Thanks for following our adventure as we continue our preparations for the Texas Water Safari. Next time you eat in San Marcos try Bobcat Nation Sports Bar and Grill. My brother owns the place! Thanks for the heads-up. We will definitely have to try out your brother’s place. I will also tell Jonathan about it.